Blood Suckers II is the sequel to Blood Suckers by Netent. It begins with an animated sequence to set the scene. Of course, it’s all about Vampires and this time around, there’s even a real story to boot. Once started, the game continues to look the part. 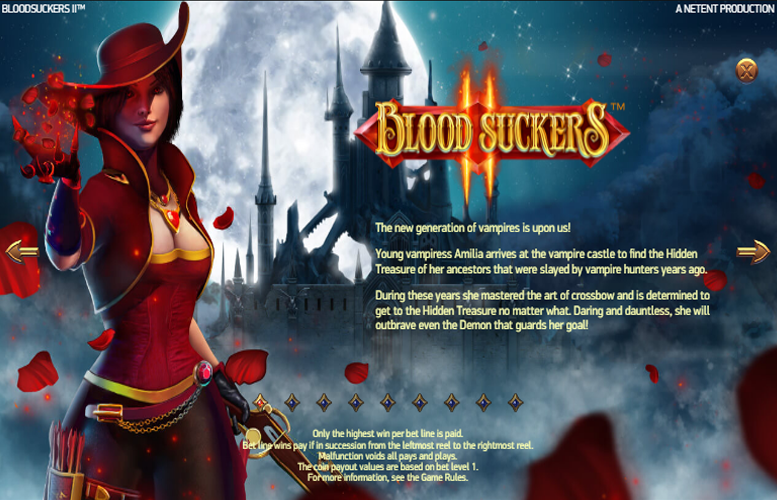 A foxy looking female vampire comes alive next to the reels when bonuses or winnings are awarded, and the symbols and backdrop are tastefully designed. The game has several decent bonus features too. Although if you’ve played the original game, you’re unlikely to be blown away by any of these. Stylish machine with a good theme. Who doesn’t like a thrilling tale of Vampires? Animated game with a story line. It doesn’t add that much on the original title. The one additional bonus feature is a bit weak. Other than that, it’s variations on the tried and tested formula. “Wild” = 10,000x the line bet. “Scatter” Roses = 2,500x the line bet. Red Vampire = 500x the line bet. Orange Vampire = 200x the line bet. Green Vampire = 200x the line bet. Blue Vampire = 200x the line bet. 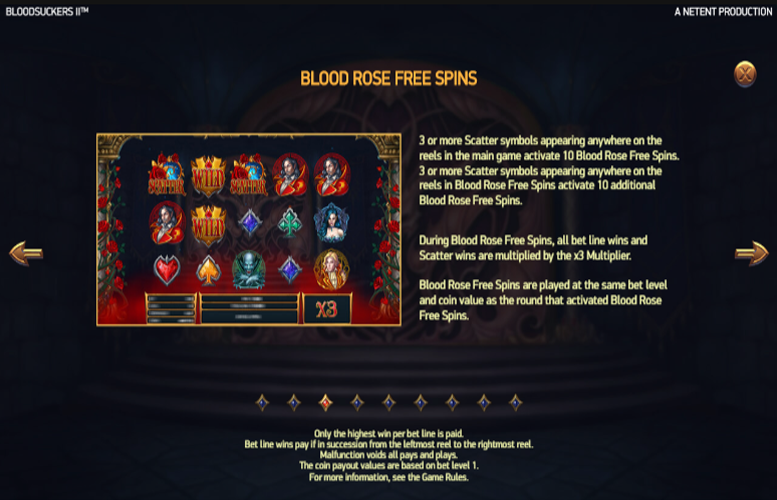 Landing three or more of the “scatter” symbols anywhere on the reels during the main game will activate 10 Blood Rose Free Spins. During these free spins, all bet line wins and “scatter” wins will be subject to a 3x multiplier. The free spins are played at the same wagering level as was used during the main game. What’s more, these free spins can be retriggered by landing an additional three “scatter” symbols on the reels during the bonus round. 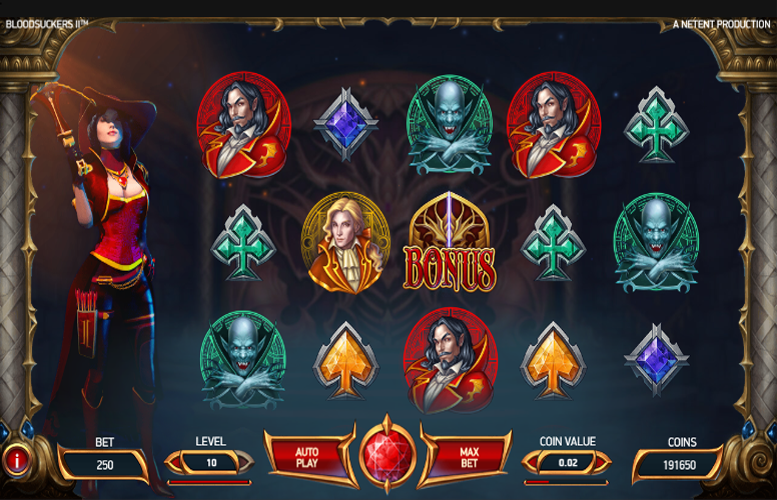 In the main game, landing three or more “Bonus” symbols anywhere on consecutive reels starting from the leftmost reel will activate the Hidden Treasure Bonus Game. 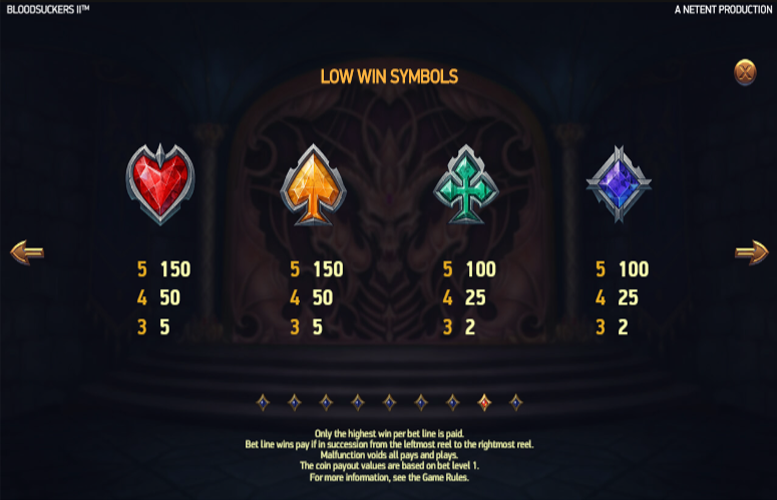 If the Hidden Treasure Bonus Game is activated with four “Bonus” symbols, all coin wins in the bonus feature are doubled. As you can probably guess, if the five “Bonus” symbols triggered the stage, the winnings will be tripled. During this mode, the player must select coffins and chests to reveal coin wins, a key symbol, a “scatter” symbol, or the Demon. The “Scatter” symbols are collected. If the player has amassed three “scatter” symbols, by the time the bonus is over, they’ll be awarded 10 free spins. Revealing the key will advance the player to the next level. If the key symbol is revealed at the last level the player is awarded the Great Treasure Win of 1,000 coins multiplied by the bet level. If the Demon is revealed, the Hidden Bonus Game ends. The Scatter Shot feature is activated at random during gameplay. 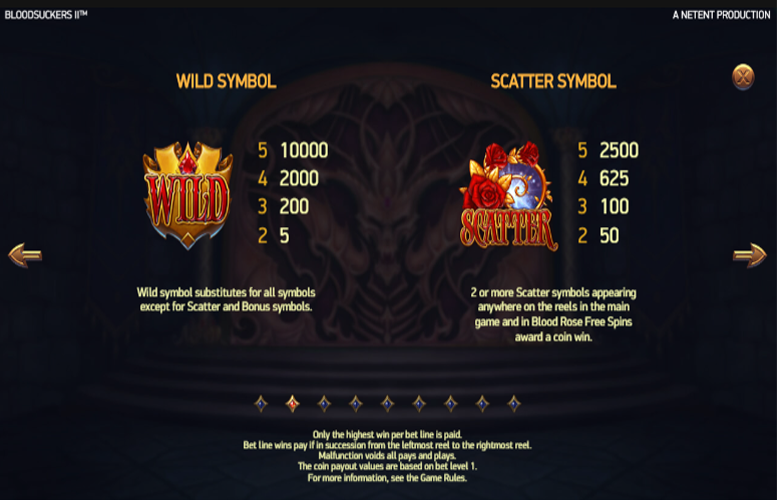 One extra “scatter” symbol can be awarded, activating 10 Blood Road Free Spins. All medium win symbols on the reels award coin wins of 10 to 100 times the bet level. This feature is also triggered at random. If activated, one extra overlay “Bonus” symbol is awarded on reel one, two, or three. Hearts or Spades = 150x the line bet. Clubs or Diamonds = 100x the line bet. The number of win lines on Blood Suckers II is fixed at 25. This means that players are only able to vary the value of the coins they bet with and the number of coins they bet on each one. The minimum coin value is 1p and the maximum is £1. 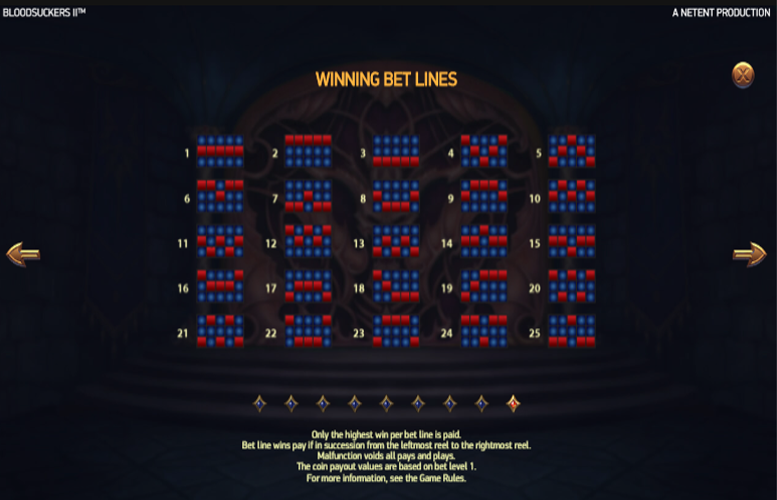 Meanwhile, players can choose to bet between one and 10 coins per line. This makes the lowest and highest possible bets per spin 25p and £250 respectively. All told, Blood Suckers II is a good enough game for those who either love the original game or have never played it. Casual fans of the first Blood Suckers will likely find the sequel doesn’t offer enough in the way of innovation. It very much feels like more of the same, which isn’t necessarily a bad thing. Also, the like original, it offers a huge return-to-player rating.